Background: Targeted therapy has been widely used in the treatment of patients with metastatic renal cell carcinoma. The current available therapies focus on the inhibition of angiogenesis through targeting the vascular endothelial growth factor receptor, and protein kinase such as the mammalian target of rapamycin. Compared with other traditional chemotherapies and radiotherapies, targeted therapies dramatically improved progression-free survival. However, microenvironment of patients’ body, drug-drug interactions, as well as polymorphisms of metabolic enzymes and drug transporters ABC could influence pharmacokinetic characteristics. Therefore, targeted therapy has been shown to present a large interindividual variability. Therapeutic drug monitoring is the clinical practice aims at improving efficacy and reducing toxicity by measuring drug concentration in biological samples and adjusting drug dose for each individual. Conclusion: Therapeutic drug monitoring is widely employed under the situations such as lacking of therapeutic response, emerging of severe or unexpected toxicities, with narrow therapeutic windows or potential drug-drug interactions. 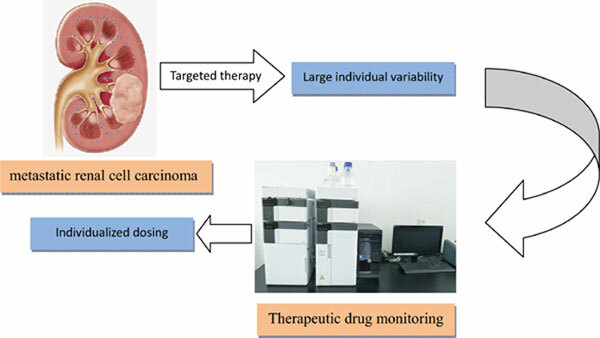 The development of Therapeutic drug monitoring in targeted therapy have been proposed in recent years, more and more targeted therapies are benefit from therapeutic drug monitoring. It is showed significant benefit in the individual targeted treatment of metastatic renal cell carcinoma. mRCC, TDM, targeted therapies, inter-individual pharmacokinetics, molecular mechanism, exposure and response relationship.